This brought back a memory to me of the Union Carbide International Company's Typing Pool on the 4th floor of the old Carbide Building (new in 1960) at 270 Park Avenue in Manhattan. Head of the pool back then was a Mrs. Duran, and she and others could type in several languages other than English. They also were helpful in translating communications that would come in from overseas, outside of the company, which were written in French, Spanish, Portuguese, etc. I never learned to type on a typewriter. I was afraid of getting stuck in a typing pool. When I left high school and made the attempt to work at the F.B.I, I met a girl that I roomed with for the initial training. She had a Master's in French, had spent two years in France, and had applied to be a translator (when French was the language of diplomacy -LOL). The Bureau found out she could type and put her into the typing pool. That was when we both decided it wasn't going to work and quit. I've never had a job where typing was a key to success. At school we had a printer such as you describe (IBM 402 IIRC) that made a terrible racket, especially in the sterile, hard surfaced data processing environment. It seemed to do about 120 lines per minute, which was amazing with all the mechanics involved. It could be programmed to tabulate and do some elementary computations by means of interchangeable Bakelite boards with holes drilled all over them and information printed on them. The programmer had a bunch of wires of various lengths that were plugged into the boards, similar to switchboard connections. The conductors were exposed at the back of the board and the board was mounted in the printer to make the appropriate connections. I never did this for money. I have been paid to use 80 column record forms and 132 column printer layouts. The input files were on 80 column punch cards, produced on an IBM 024, 026 or 029 keypunch. These were run through the card sorter, which sorted them mechanically, as the printer required data in order if it was to make required control breaks, such as sub-totals. The first actual computer I programmed was an IBM Spectra 70, which was similar to the IBM 360. The operator communicated with the computer via Teletype. The 80 column cards were still in use as one input choice with an early Wang mini-computer (Wang 2200, I think) that I used. The card reader stood alone and used a vacuum to pick the cards. It was about as loud as a Hoover. The cards did not have to be sorted before being read. By that time the computer could do its own sorting. Well into the 1980's when input files came mostly on tape, a lot of records were still 80 bytes. It took a while for the other technology to catch up. 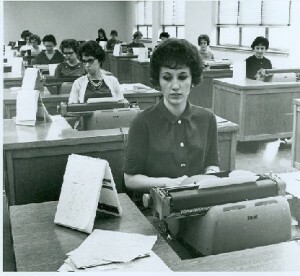 Programs were used to reading 80 byte records and data collection forms were still formatted for keypunch operators. Remember when you had to avoid the use of the decimal point on impact printers? With the type hitting the paper with a "." lined up vertically with a bunch of other points, it was like making a perforated form that would "tear along dotted line" even when that was unintended. Spaces usually substituted for points. Some bank checks are still printed with the sum written in boxes separating the whole numbers (dollars) from the decimal numbers (cents). Those rotary phone dials made lots of noise, too. And did you ever work around a mainframe computer with a line printer? The printers I worked with (UNIVAC 1004) could print 132 characters per line, using 132 hammers that would whack the paper from behind to make it strike against the rotating type drum at just the right moment to catch the desired character. The drum was spinning fast, and all 132 hammers would whack in a split second, after which the paper would advance to the next line. The noise was deafening. Offices used to be much noisier. This one, with all those machines clattering together in that big room with the hard floor, looks especially noisy. In addition to all those types striking all those platens, with no insulation but a piece of paper or maybe a carbon paper sandwich, there were the end-of-line bells and the sound of the carriages ratcheting back before another line could be started. When the IBM Selectric came along, it wasn't much quieter but there was no ratchet and one could buy a kit with acoustical insulation that covered most of the exposed parts of the machine. Telephones used to have mechanical bells and even with multi-line phones, some people still had more than one phone on their desk.